Orson Welles's Harry Lime might not have had much time for the Swiss, but the BMW Sauber team have their own personality, and it was fun to see the guys let their hair down after the amazing result in Canada. That win has been a long time coming, and for it to happen with the other car in second place - the same way that Jordan broke their duck at Spa 10 years ago - made it even better. Among those with the biggest smile was team manager Beat Zehnder, whose career with the team goes way back to the Group C days, when he was a mechanic for the likes of Jean-Louis Schlesser and Jochen Mass. He remains a close friend of 2001 Sauber driver Kimi Raikkonen, but for once he didn't mind that his old pal had endured a bit of misfortune. "I'm speechless, I don't know what to say!," smiled Beat. "I'm overwhelmed. It's been 15 and a half years in F1, 260 races, so it's a very bad average. It's only chief mechanic Urs Kuratle and me who did all the races in F1. Two or three times we've been very close, with Jean Alesi, with Heinz-Harald Frentzen, with Johnny Herbert, and now it happened. I think we deserved this win, and not only in terms of the length that we were in F1." Zehnder has seen the team grow over the years, but he insists that it retains much of its original character. "I think the mentality from the south Germans - the Munich guys - and the north Swiss, is pretty similar. The team haven't changed a lot. Obviously we've got many more employees, we've got much more on the money side to work with, to develop the car and so on, but I think the team haven't changed a lot. "In a way I wish we could have won a race with Peter Sauber, because obviously he made the road to what we have now, to what we are now, and I'm pretty sure he would love to be here. But he's an ambassador of the European soccer championships, so he had to be at the opening game!" The result was a just reward for technical director Willy Rampf, who had double reason to celebrate. 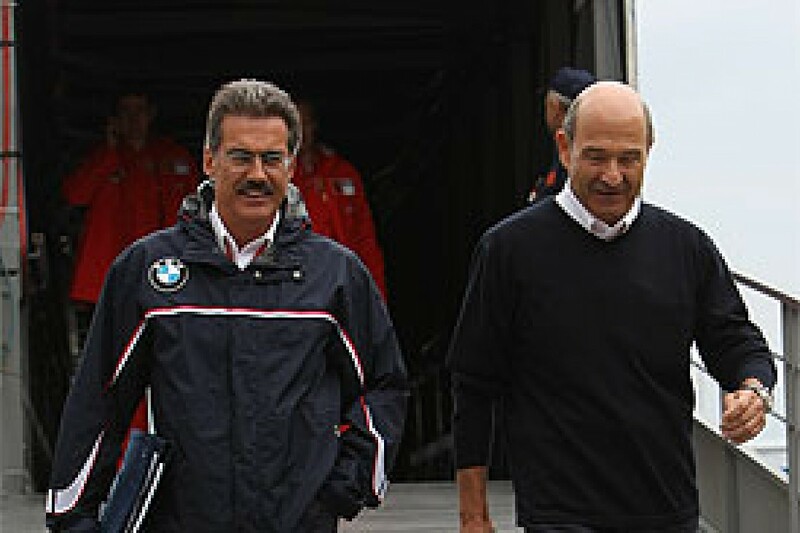 The German started his career in BMW road cars before he joined Sauber, and he went back there as recently as 1998-'99 when he fancied a sabbatical from racing. He thus already had both BMW and Sauber DNA in his body even before the takeover happened. After the win he too had his old boss on his mind. "Peter asked me if he should come to Montreal," said Rampf. "Montreal is always a nice place even if you don't win, but he's not here..."
Many of us had tipped Kubica for a strong race in Canada, and history seemed to be on his side. The FIA's Herbie Blash was keen to point out that back in 1982, BMW had scored its first Grand Prix win in Canada, when he was team manager of Bernie Ecclestone's Brabham outfit. 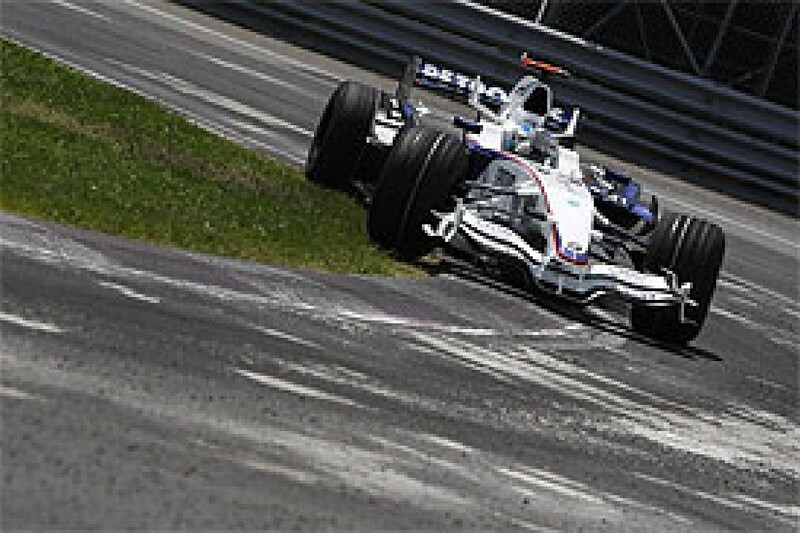 Throw in the anniversary of Robert Kubica's huge 2007 shunt, not to mention the great form he showed in Monaco, and everything seemed to be in place for a good weekend. Further proof came on Friday, when Kubica was beaten only by Massa in the morning session, and Hamilton in the afternoon. The fact that he was not happy with the balance of the car suggested that there was more to come. "True, he was not happy with the car," said Rampf. "And I don't think he'll ever be happy with the car! We could always be quicker. Ferrari were more or less the same pace, but he saw that Hamilton was quicker than us, so he should not be happy! "I think qualifying was OK for Robert, again we were on the same level as Ferrari. Nick was basically too far back, but he also had problems during the qualifying session. "I think Robert did a great job in the race. He lost a lot of time in his second stint, and it was clear he had to make up some time, not only against Nick, but also against Coulthard. Robert was outstanding, he did great lap times. We were sure that we would have both cars in front, but Coulthard was not too far away." In the post-race excitement it was easy to overlook the fact that Heidfeld had brought the other car home in a strong second place. Under pressure thanks to his struggles in qualifying, the German faced the difficult task of running to the flag after stopping on lap 29. It was the extra laps clawed back under the safety car that got him into a window that allowed a one stop run. "This was not planned. We changed the strategy and we were discussing it until the last lap, before he came in. Should we change it or not? Because it was a huge risk to change it. One thing was we had to fill the car, and we had to run with soft tyres, and there's not a lot of margin on the brakes. So it was a huge risk, but it paid out. "He was doing a good pace, but this is also the strong side of Nick, that he can manage this situation, because this was not planned. He handled a very heavy car, with the very soft tyres, and with the brakes being on the limit all the time, so he did a very intelligent race." 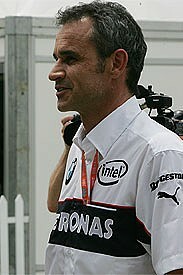 Rampf has always been the type to keep his feet on the ground, and he was the first to acknowledge that Kubica had profited from the misfortunes of others. "I think it has not changed since the first race, in that we are not too far away, and something has to happen. And it happened also today, we have to be fair. Two cars eliminated themselves in a pitlane accident, but I think we were really fighting with them, and I think this was almost the first time that we really fight for victory on our own merit." Still, you could argue that it was pressure from Kubica - and the fact that both he and Raikkonen had jumped Hamilton at the stop - that tipped the McLaren man into his silly mistake. For the second year running, Kubica kept his cool when confronted with a red traffic light that others failed to heed. "Robert is a very clever guy, and he did the same last year. Even when cars are passing him - I think it was Massa and Fisichella that time - he was still standing there. It takes a lot to do it, because you lose positions." Inevitably, BMW boss Mario Theissen has played down any title aspirations, and bearing in mind the consistent pace of the opposition, that's a logical approach. But the points table tells its own story, and it would be foolish not to go for it, even if there's a delicate balance in terms of delaying the allocation resources to the all-important 2009 project, in order to keep this year's car competitive. "For sure we are thinking about it," Rampf admitted. "It's quite nice to lead the championship after seven races! It's something that we never had before, we were always far away from this level. But we are thinking about it, how we allocate the resources." What has really paid dividend thus far this year is the consistency of the F1.08: "I think if you have a bad car, you can be very competitive in a few races. If you have a good car, this car is competitive on all race tracks, and this is what we have." It's always said that scoring a first win changes a driver, and you could argue that it does the same for a team. Certainly Jordan raised its game after Spa 1998, at least while there was money to be spent. Rampf agreed that there was some truth in that assertion. "We have our direction how we work, how we develop the car. What is changing is that it's a huge push in the company and a huge motivation that what we are doing is the right thing, especially after all this - let's say - criticism at the beginning of the year that our car was quite slow. I mean, we still followed that route, and it's paying out. It gives a lot of confidence for my people in the team." It's easy to forget what a big decision it was back in 2004 when BMW quit Williams and join a team that seemed forever stranded in the middle of the pack. Hindsight suggests it was a stroke of genius. "I think this win very important for Peter Sauber," said Rampf, "because he has basically done the right move to sell his team, and it's also a very good confirmation for Mario Theissen after going in this direction, because it's always a big risk in this business. So for them it's really a win-win situation. "There was a lot of criticism for sure [about leaving Williams], as they were winning World Championships, but in the end it confirms that what we are doing and the direction we are going in is the right thing. The target was to win one race this year, so basically we are on target. I think it's amazing and it's really a big push to the people with regard to the motivation and confidence." So now it's on to France, where last year Kubica and Heidfeld finished fourth and fifth with a less competitive car than they have now. Rampf is taking nothing for granted. "I think the gamble will start again, because it's a different downforce level, so it's a different configuration, and different tyres. I think we had a good low downforce package for Canada, but we also have very good brake stability on our car, and this was for sure helping. "For sure we will do our best, as we have done here, but we have to be realistic - there are still two teams with the same or slightly quicker pace."